Wollastonite Group Mineral Structure: The three silicate tetrahedra repeating part of the wollastonite group minerals is depicted in the center (from Ciullo, 2002). 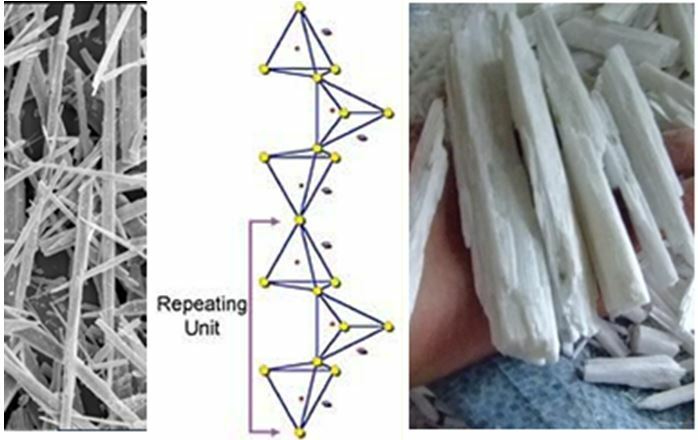 Because of this twisted single chain structure, wollastonite group minerals tend to grow acicular (needle-like) masses (right) which are also preserved in their cleavage (how they break). The left photo is a picture from a scanning electron microscope where the laths are measured in tens of microns (a micron is one millionth of a meter). If you have collected the brilliantly white wollastonite in New York you have probably extracted these needles from your finger tips or brushed them from your clothes. Wollastonite is a common mineral in metamorphosed limestones, particularly in contact style metamorphism with igneous rocks. But it usually contains significant iron, manganese, and other elements that render it ineffective for industrial use in ceramics, filter applications, pigmentation in paints, etc. The New York deposits are unusually pure. 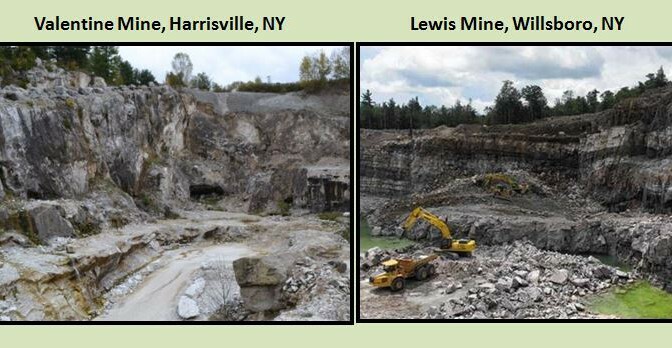 But enough on wollastonite: What are the other wollastonite group minerals and where might we find them? Here they are from Fleischer, 2014. 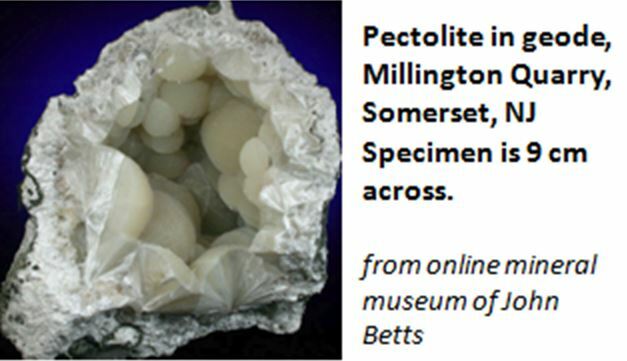 You may recall pectolite from last month’s WCGMC newsletter. Larimar is copper-bearing pectolite and highly sought for its color and polished appearance. The mineral itself, pectolite, is similar in structure and chemistry to wollastonite, but is modestly hydrated (a single OH group) and also contains sodium (Na). Unlike wollastonite, which often grows in large parallel masses, acicular prismatic splintered pectolite needles usually form as sprays or radiating aggregates. It is typically found in the linings of basalt cavities or in geodes. Serandite is another Wollastonite Group mineral sought after by collectors both as a mineral specimen and in rare occasions as a gemstone. 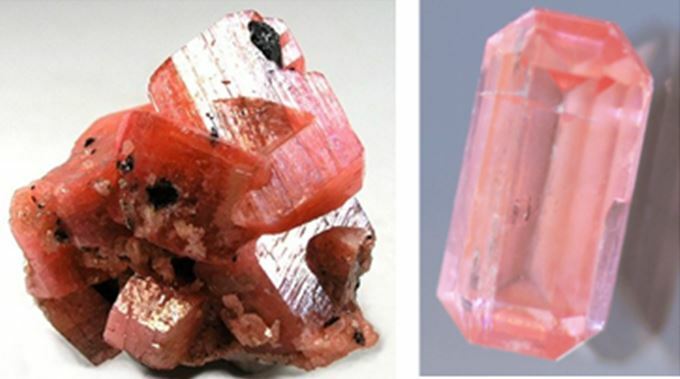 Like many manganese bearing minerals, serandite in salmon-pink in color and like the other minerals in this group crystals are often acicular or radiating. But it can grow quite gemmy and although it only carries a hardness of 5-5.5, it can be cut into very attractive gemstones. The mineral is not particularly common, but does occur in a number of geologic environments where manganese (Mn) is found. 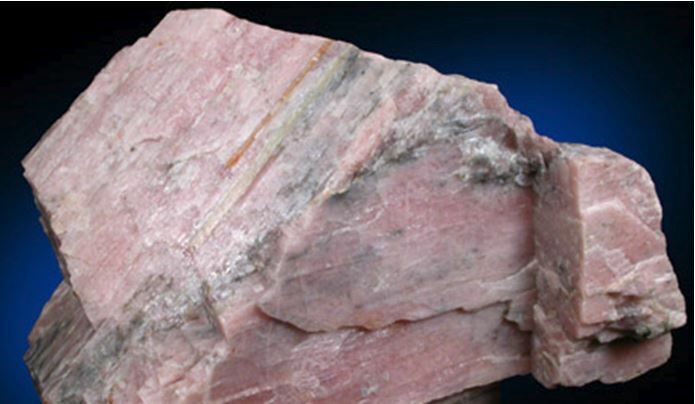 At Mont Saint-Hillaire in Quebec, serandite is found associated with pegmatites cutting syenite intrusives. Both the miniature serandite specimen on the left (4 cm across) and the 6.6 mm (0.45 ct) rectangular step cut gem on the right are from the famous mining and mineral collecting Mont Saint Hilaire District in Quebec. Bustamite is another manganese-bearing mineral classified in the Wollastonite Group by Fleisher, although its chemistry places it intermediate to the manganese silicate mineral rhodonite (but that’s another group for another month!). And yes, with the manganese component bustamite, is also pink. Bustamite is not common, but look for it at Franklin, NJ, or the next time you go to the Broken Hill Mining District in New South Wales, Australia! Ciullo, P.A., 2002, Wollastonite: A Versatile Functional Filler, Paints and Coatings Industry Magazine, Nov.
Fleischer, M. E., 2014, Fleischer’s Glossary of Mineral Species, Publ. by Mineralogical Record Inc., 420 p.